The Dr D P Rastogi Central Research Institute for Homeopathy in Noida was inaugurated today by Sri Shripad Yesso Naik,the Minister of State for Ayush (Independent Charge) and Health and Family Welfare.Promotion and development of Homeopathic System of Medicine and carrying out advanced research on scientific lines in homeopathy is the key role of the Institute. Speaking on the occasion, The Minister said that Homeopathy and other alternative systems of medicine have now come into focus and the Indian Government is making all efforts to provide high quality AYUSH facilities to the people. Dr D P Rastogi Central Research Institute for Homeopathy has facilities of a high order facilities including X-ray, ultrasound, blood tests, ophthalmology, ENT, physiotherapy.The Institute has a 50 bedded IPD and caters to need to nearly 600 OPD patients per day. The Ayush Ministry has tried to take forward the Swachh Bharat Abhiyan by initiating a Swasthya Raksha Programme to protect and promote health for preventing, identifying and treating the diseases related to poor hygiene and sanitation. The Institute at Noida has also adopted 5 villages and thousands of people have already benefited under the programme. TheCentral Council for Research in Homeopathy has designed a programme ‘Homoeopathy for Healthy Child’ with the aim to sensitize health workers, patients and care givers to deal with conditions such as diarrhea, respiratory infections, dental conditions, skin conditions etc through Homeopathy. The programme is being implemented in 10 districts including two blocks of Gautam Budha Nagar. 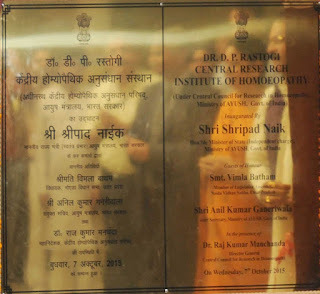 To promote Dr D P Rastogi Central Research Institute for Homeopathy as one of the premier research institutions of Homeopathy, two state of the art laboratories are being established for undertaking basic research in Homeopathy. With this, the Institute will become an asset for the entire Northern Region of the country in providing health care services to the people and advanced research. Dr Rastogi was an outstanding name in the field of homeopathy and its a matter of proud that the Institute is named after him.The state of art laboratories to be set up will take the homoeopathy system of treatment in India to new heights. The popularity of homoeopathy system of medicine is increasing very rapidly. There are 190 medical colleges of homoeopathy and thousands of students are passing out every year from these colleges. At present, there are 2.5 lakh registered practitioners of homoeopathy in the country.